In honor the ASU's big win over Notre Dame on Saturday, I figured I would provide my college football fan readers with a look at the history of Sun Devil Stadium in Tempe, AZ. The stadium is located on the campus of my alma mater Arizona State University, and has been home to the ASU football team since the 1958 season. The stadium was also once home to the Phoenix Cardinals/Arizona Cardinals of the NFL from 1988-2005. If you are ever in the "Valley of the Sun Devil" during college football season, I highly suggest catching a game at this great stadium! "One of the most aesthetic, dynamic, innovative and beautiful collegiate stadiums in the nation, Arizona State University's Sun Devil Stadium has played host to some of the best football games for more than four decades. 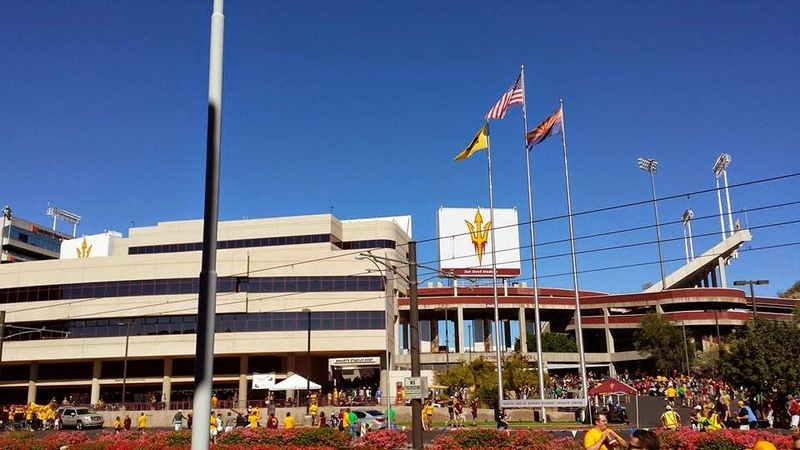 It has hosted Arizona State University football games since 1958, including the game on Sept. 21, 1996, when the playing surface was named Frank Kush Field as ASU upset top-ranked Nebraska 19-0. It has hosted four national championships - Notre Dame vs. West Virginia in 1988, Nebraska vs. Florida in 1996, Tennessee vs. Florida State in 1999 and Ohio State vs. Miami in 2003. And it played host to the NFL's ultimate showcase - the 1996 Super Bowl where the Dallas Cowboys pulled out a close win over the Pittsburgh Steelers. The stadium, a favorite of television production crews, was the home of the Tostito's Fiesta Bowl for 35 years and the NFL's Arizona Cardinals for 18 seasons. Beginning in 2006, Sun Devil Stadium became the new home of the Insight Bowl. 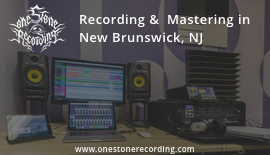 The facility, regarded since 1958 as one of the nation's outstanding collegiate football facilities, also boasts a spectacular, second-to-none setting. A complete playing surface renovation was christened by ASU on Sept. 5, 1992, as the Sun Devils hosted Washington in the season-opener. At a cost of $2 million, the stadium addition accomplished four goals: 1) provided Sun Devil Stadium with a more durable playing surface; 2) provided better patron sight lines in the lower seating levels; 3) expanded sideline area for player safety; and 4) provided advantages to television and print photographers. Constructed between two mountain buttes, the stadium literally was carved from the desert, and occupies a space between the Tempe buttes - actually small mountains that ideally have accommodated the growth of the structure. Sun Devil Stadium addresses Phoenix to the west and the south end zone (formerly the open end) points to scenic Tempe, home of Arizona State University. With the south end expansion completed and the press and sky boxes in place, and with an expanded cantilevered upper deck (1977), Sun Devil Stadium boasts a capacity of 71,706. The expansion of 1988, which added a large seating section that completed the oval of the stadium, added almost 1,700 seats to the stadium's capacity. Also added was the Intercollegiate Athletic Complex at the structure's south end, which is now named the Nadine and Ed Carson Student Athlete Center. The building houses the entire realm of the ASU athletic department. A state-of-the-art scoreboard and four-color video replay board were also added. During the 1978 expansion, design features enabled the stadium to be modernized without light supports, sound system supports, or construction pillars in the viewing line of the spectators. 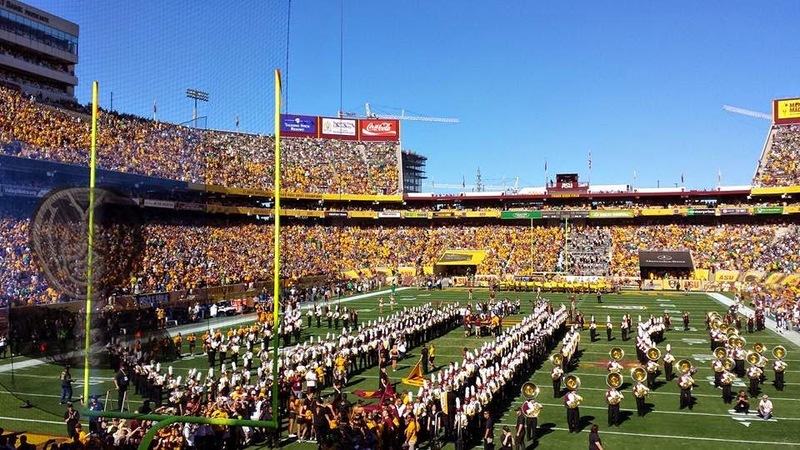 The dramatic proximity of every seat to the playing field is another feature that has made Sun Devil Stadium one of the nation's finest college football arenas. Originally erected in 1958 (capacity 30,000), the stadium additions were begun in 1976 (boosting capacity to 57,722) and 1977. The latter raised the seating to 70,491. The expansion effort was an $11 million undertaking, accomplished completely without the aid of state tax monies. Assisting in a stadium financing plan unlike any other in the nation, the largest and oldest Arizona State support organization, the Sun Angel Foundation, provided $4.5 million of the necessary funding. The Sun Angel contribution was particularly important because it also helped pave the way for bond clearance. Spectators at stadium events also have helped fund the expansion with their payment of a surcharge on each ticket purchased. Arizona State has led the Pacific-10 Conference in average attendance seven times (1986, '85, '84, '83, '82, '80 and '79) since joining the league in 1978. ASU finished second six times and third twice. Last year, the Sun Devils drew a home total of 339,890 fans. 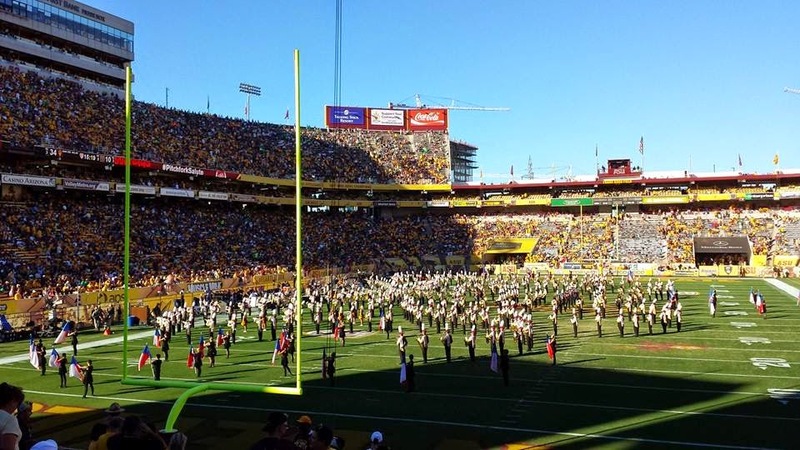 On a single-game basis, Arizona State averaged 48,556 spectators. The first game was played in the original structure against West Texas State on October 4, 1958. The Sun Devils triumphed in the baptismal event, taking a 16-13 verdict over the Buffaloes. Following the 1976 portion of the expansion, Arizona State took a 35-3 victory over Northwestern on September 17, 1977 to continue the winning tradition of stadium christenings. When the 1977 expansion was completed, the Sun Devils prevailed 42-7 over Pacific to post a hat trick on stadium dedication contests. In 1988, ASU defeated Illinois, 21-16 on September 10, to win its fourth dedication game. In 1989, ASU beat Kansas State 31-0, in the expansion opener. In 1987, the stadium was filled beyond capacity for the Papal visit, one of the few sites to play host to the Pope's tour of the United States. On April 4, 1976, the New York Cosmos (with Pelé) and the Los Angeles Aztecs played an exhibition soccer game in front of 15,000 fans in the stadium. In 2008, the New England Patriots used the stadium as their practice facility in preparation for Super Bowl XLII.